I’d like to send out some birthday love to my Mom today! Look, I made you a cake! 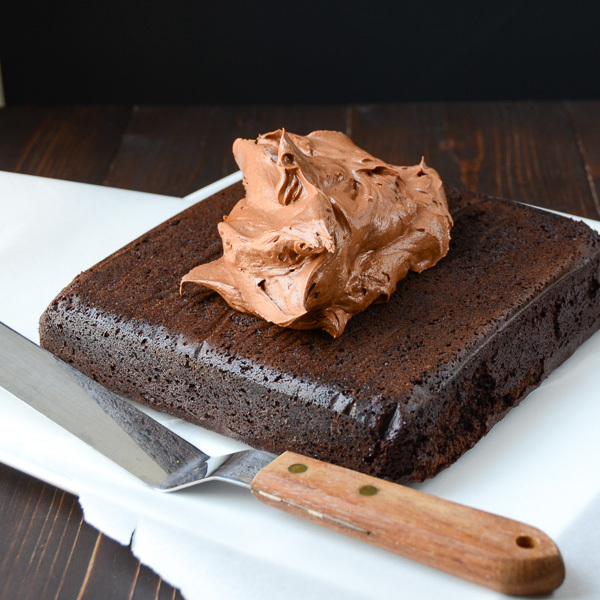 And not just any cake – it’s the Smitten Kitchen’s “I want chocolate cake” cake! I even swirled the frosting like Deb and I searched several baking shops to find the right sprinkles! Anything for Mom and birthdays, right? 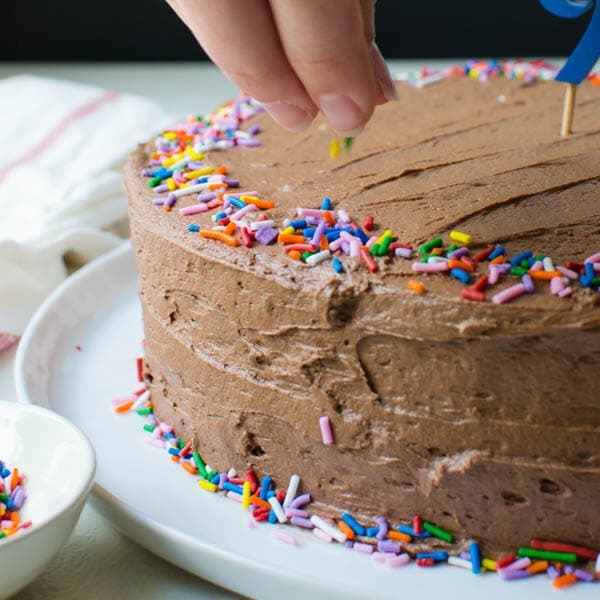 And this Easy Chocolate Cake with Chocolate Frosting is just that — easy! I’ve followed Deb Perelman and The Smitten Kitchen for several years and actually turned my Mom onto her blog too, which is one of the reasons I picked this recipe. Actually, I figured Mom would also appreciate it because it’s not one of those mastodon behemoths that feeds 20 people. 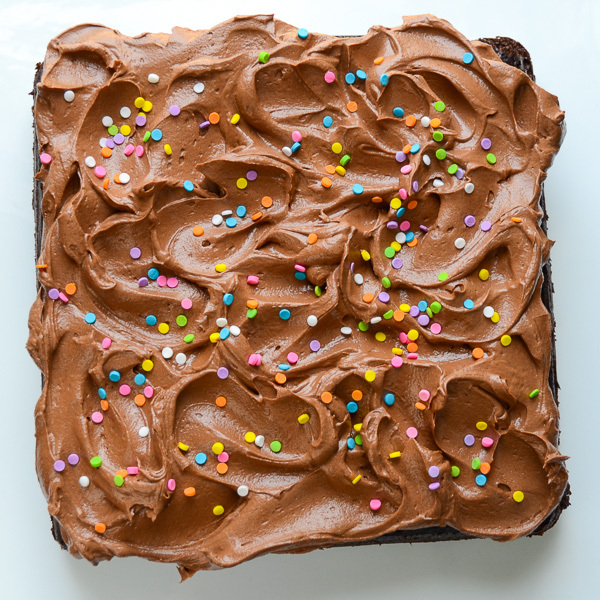 Nope, it’s a simple (but decadent) one layer gem! 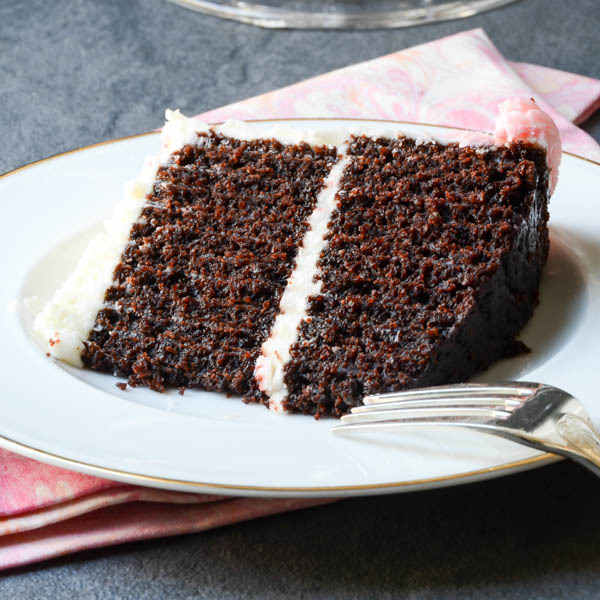 It’s rich and deeply chocolatey with a thick layer of silky buttercream. Sigh! 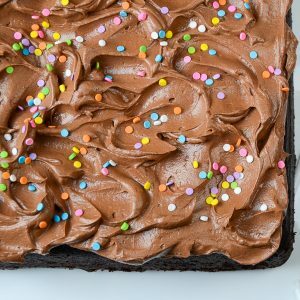 The beauty of this cake is that it gets mixed together in one bowl – no fancy techniques, just a simple, reliable recipe that will have your family fighting over the bowl and beaters while you hoard the spatula for yourself. 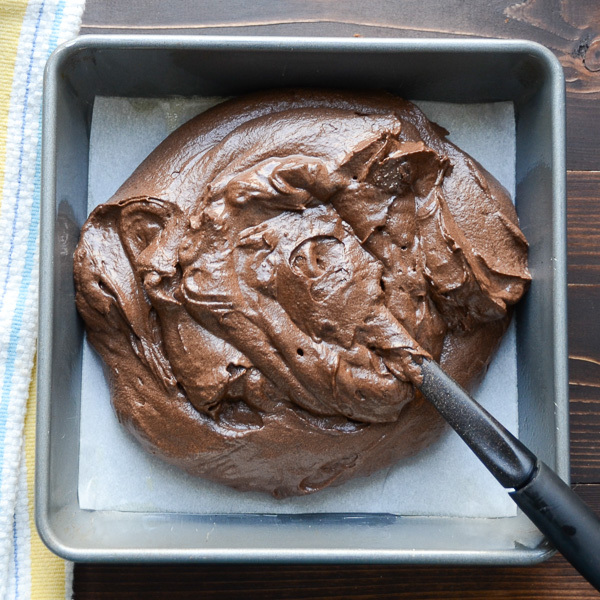 While the cake bakes, whip up the frosting in another bowl reserving the spatula for yourself. This gorgeous buttercream is a dream to work with. It’s lush and smooth and responds well even to my amateurish attempts to swirl and prettify. 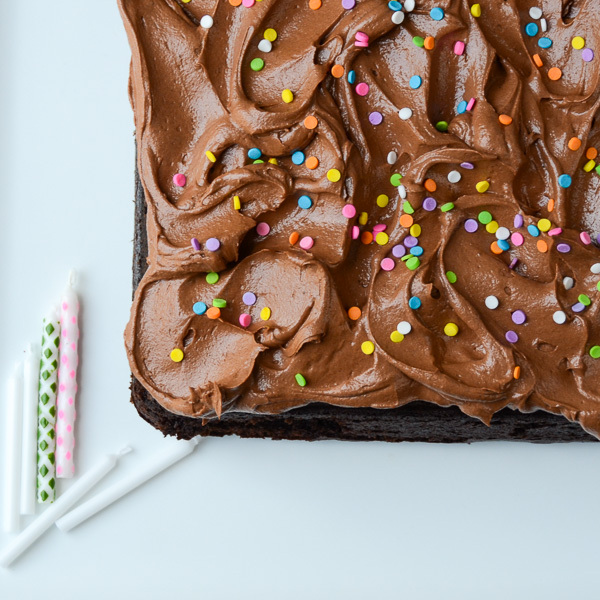 This chocolate cake is just enough to get you past that persistent chocolate craving niggling at the back of your head, without the commitment of a double layer cake. Frankly, it’s perfect for Mom’s birthday — because, get this… my Dad’s birthday is on Friday! I know – more cake! Oh, and I haven’t forgotten Paula – my cousin-in-law who’s celebrating her birthday sandwiched in between my Mom and Dad! Talk about a sugar-coma inducing week of birthdays! I better get out my fat pants. Sometimes you just need chocolate cake. Not a big layered production -- just fudgy cake to jam into your mouth. This is it! Preheat oven to 350 degrees. Spray the bottom and sides of an 8" square cake pan with vegetable spray. Cut a piece of parchment paper to the dimensions of the cake pan and fit it into the bottom (this is an extra layer of protection against sticking). Set aside. 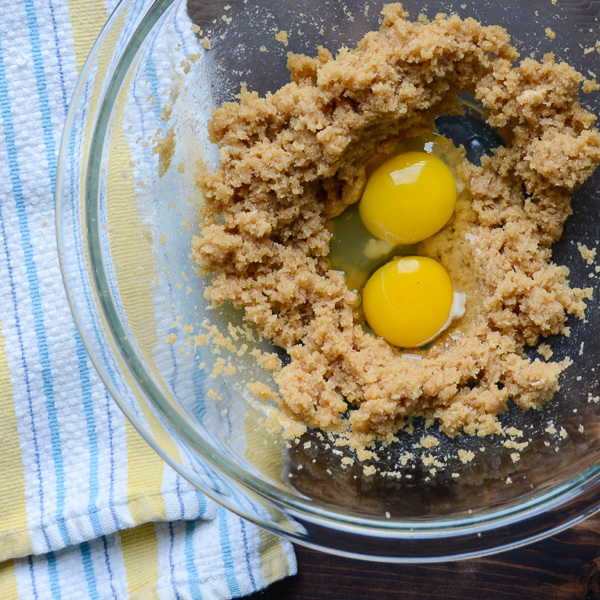 In a large bowl, beat the butter, brown sugar and granulated sugar until fluffy. Use a rubber spatula to scrape down the bowl. Add the egg, egg yolk and vanilla and beat until combined. Add the buttermilk and beat again -- mixture will look curdled, it's ok.
Sift together the dry ingredients and beat into the butter mixture on low speed until just combined. 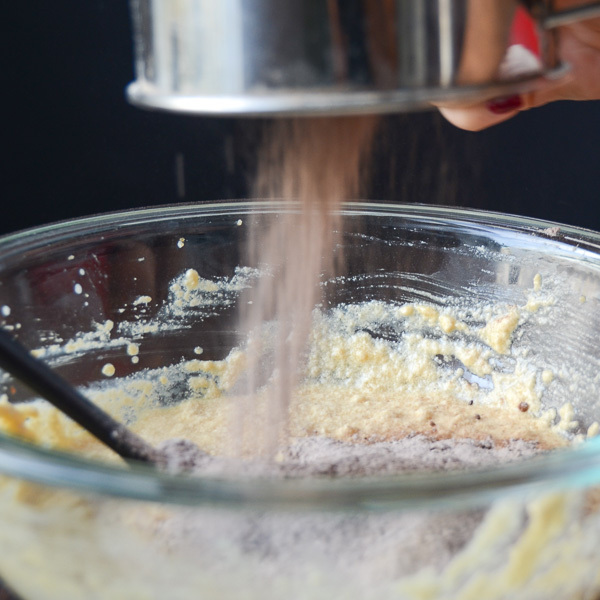 Transfer the batter into the prepared pan and use a spatula to spread it out evenly. Bake for 30-35 minutes until a cake tester comes out clean. Cool the cake for 5-10 minutes in the pan, then invert it onto a cooling rack and cool cake completely before frosting. Melt the chocolate: Place the chocolate in a small microwaveable glass bowl and microwave in short 15-20 second increments until the chocolate has melted into a glossy pool. Don't stir. Cool to room temperature. In a large bowl combine the powdered sugar, butter, salt, cream and vanilla. Beat on medium speed until smooth and creamy. Add the room temperature chocolate and beat until well combined. Turn the beaters up to a medium high or high and beat it for a minute more. Place the cake upside down on your cake stand or platter. Spoon the frosting into the center of the cake and use an offset spatula to push the frosting out from the center in short little swirls to give it that dreamy icing landscape. You can frost the sides if you like -- my daughter was shocked that I didn't, but that's the way Deb did it on her site. Is the buttermilk wet or a dry ingredients. How much chocolate chips equals 2oz unsweetened chocolate? This looks so fun and delicious! What a perfect, chocolate treat. The frosting looks perfect! I?ll definitely be trying it sometime! Thanks for the easy recipe! Happy birthday to your sweet Mom!!!! Thanks Angie! This one is a winner! 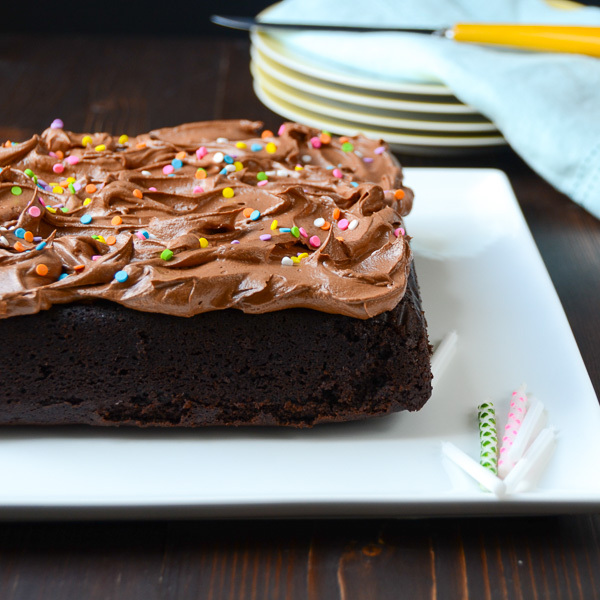 This chocolate cake looks amazing! 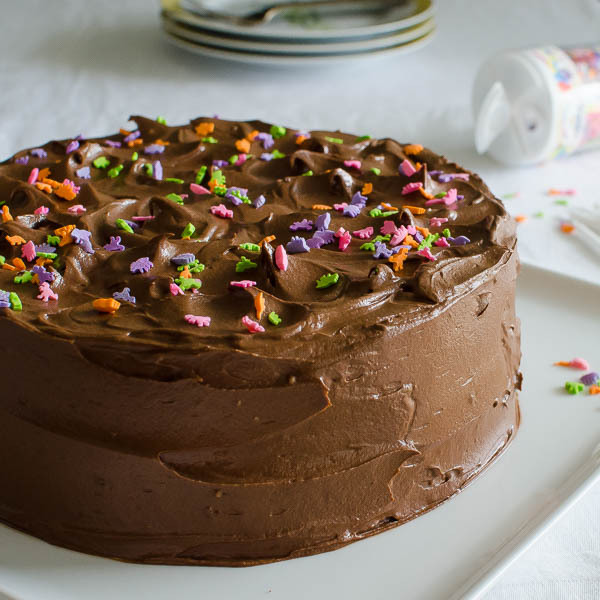 I love the touch of color with the sprinkles! I just died a little when this page loaded! Good old fashioned choc on choc cake! It’s been so long and now my craving begins! This is so adorable and perfect for birthday festivities. Or just any day you feel like a fabulous cake. The photos are spectacular. We’re ready for the party! You had me at easy! This cake looks amazing and super simple for me to make! Can’t wait to try it! This cake looks amazing! Happy birthday to both your parents! February is like that in our house–two kid birthdays plus Valentine’s Day. March is always a let down. Thanks Melissa! I concur with your February! And of course, next week is Father’s Day! What a delicious and simple (to make) looking cake! Those frosting swirls are so pretty. 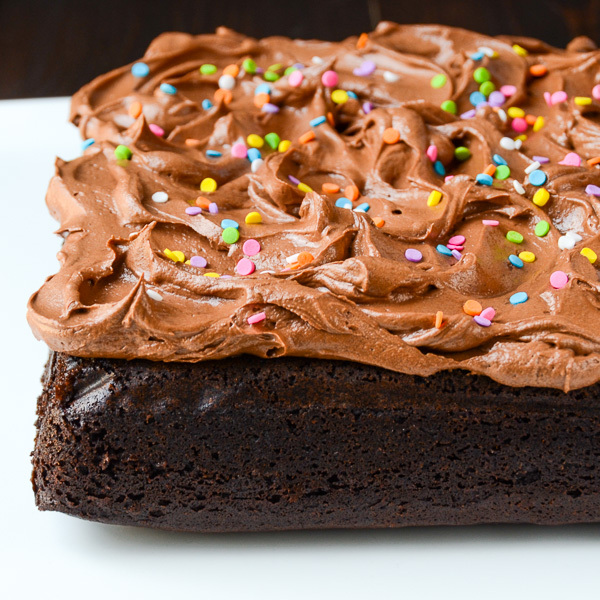 I love a good slice of chocolate cake more than almost anything, so I’m itching to give this one a try. I’m so glad you like it Tracy! I seem to have a constant chocolate craving ‘niggling at the back of my head’ — this is right up my alley! Thank you, Anita! Glad you like! Simple but from scratch. That always works for me. Your batter looks really good and the frosting goes without saying. Can’t go wrong with chocolate cake, right Peter? Gorgeous swirls in your frosting! This cake looks absolutely amazing. Happy birthday to your mom! This looks fantastic! I love that the cake is a one layer! Thanks, Katrina! I have nowhere near your skill!